When should I use a Do Less? Use a Do Less goal for things you want to limit. You're probably still going to do it sometimes, but you want to do it less often. What if I NEVER want to do something? But we strongly recommend that you use a Do More goal to Not Do Something at a rate of 7 days/week. Many users find that Do Less goals with 0 rate are more of a pain to manage. You might also lose out on any extra motivation from watching the graph build over time — the goal just stays a boring flat line, and any lapses are really obvious! Instead of making a Do Less goal to eat 0 potato chips, I would make a Do More goal to spend a day without eating potato chips, 7 days a week. But yes, if you really want a 0-rate Do Less, you can do that. How should I enter data for a Do Less? Beeminder needs to know how much you did that day. Behind the scenes, it adds up all your datapoints to show you how much you've done since starting the goal. Let's say I have a goal to drink less coffee — at most 4 cups per week, to be exact. I drank 0 cups today, I submit a 0 to my graph. Tomorrow, when I drink a cup, I'll submit 1 to my graph. The next day, I abstain again, so I submit a 0. And so on. I'm below my road — doing better than my goal rate! Cool. And Beeminder's keeping a running total of all my progress for me, so I know I've only had 1 cup of coffee since starting my goal. What happens if I never enter data? With a Do More, if you abandon the goal, you'll eventually crash into the road and derail. But the Do Less goal has no power over you if you don't actually use it. 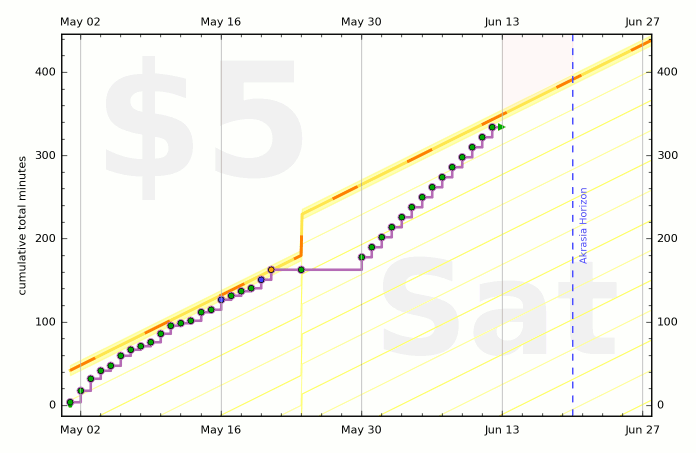 See how when I didn't do anything on my Do More goal, it derailed a bunch? But not entering data on my Do Less goal just gave me a ton of safety buffer, even though I was doing the thing quite a bit. So we came up with the pessimistic presumptive report (PPR), an automatically-entered datapoint that assumes data if you don't enter any yourself. Given enough time, the PPRs will eventually cross over the road, and you will derail. This helps keep the goal effective: as the data climbs nearer and nearer to the road, Beeminder will start sending you more and more frequent reminders about the goal, which will hopefully remind you that you wanted to stop doing that thing! To get rid of a PPR that has already been entered, just enter your data for that day! Beeminder will automatically delete the PPR datapoint when you add data, so that the only data for the day is the value you told us. To remove multiple days of PPRs, you need to add your true datapoint for each day (or delete them using the Data tab). You can turn off the PPR in the goal settings at any time. If your goal's Data Source is set to anything besides manual, the PPR setting will not appear, because Beeminder won't let you turn them on. Why is my Do Less goal going up, when I want to be doing it less? The Do Less goal is graphing the cumulative number of times you've done that thing since the goal began. In most cases, you can't undo things once they've been done (e.g. can't unsmoke a cigarette, can't uneat a pint of ice cream), so that number will always be 0 or increasing. The goal is to make sure it increases more slowly than the yellow brick road, so that you stay below the limit and avoid derailing! I'm going on vacation and won't be working on my Do Less goal. How can I pause it temporarily? For a Do Less goal without automatic data, all you need to do is make sure the PPRs are turned off, and then enjoy your vacation! If no data is entered while you're away, you cannot derail. You can get rid of any unwanted safety buffer when you return, or enjoy your new allowance. If your data source is automatic and you'll be doing it on vacation, and/or if you're a big Quantified Self fan, you might still want to enter your data for the break period without being at risk of derailment. You can use Take a Break to increase the rate temporarily, so that your vacation data still falls below the road. 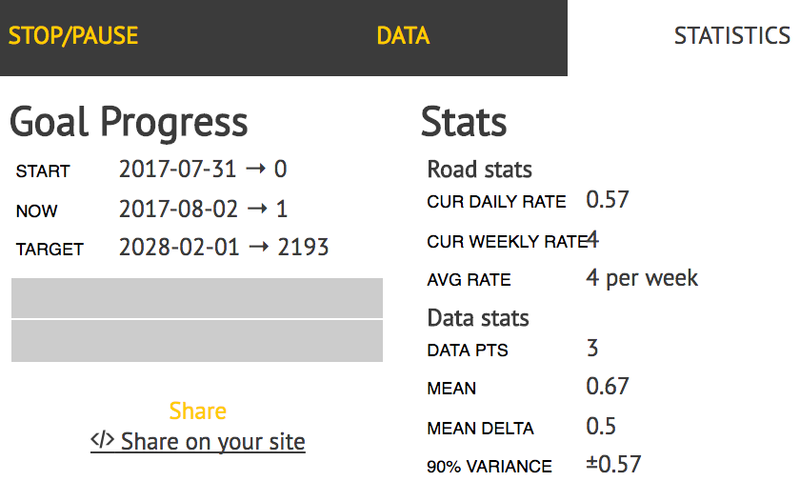 Bee Plus or Beemium subscribers who want even more fine-grained control might find the Road Editor useful for controlling or redrawing the graph history to reflect break periods. How do I get rid of extra safety buffer on my Do Less goal? Use the Reduce Safety Buffer section in the Commitment tab below the graph to choose the number of units of safety buffer you want, then click Retroratchet! to apply. My goal was red yesterday, but it didn't derail! This is a known Beeminder technicality, and we're okay with it (for now). Even though you went over the limit one day, you didn't go over far enough to fall off the average pace... yet. But you can't do that two days in a row, so you need to be extra careful today!